Focus on quantifying the impacts of land use change on biodiversity, from field scale through to landscapes and national scales, and our research also includes impacts of climate change and other environmental drivers. 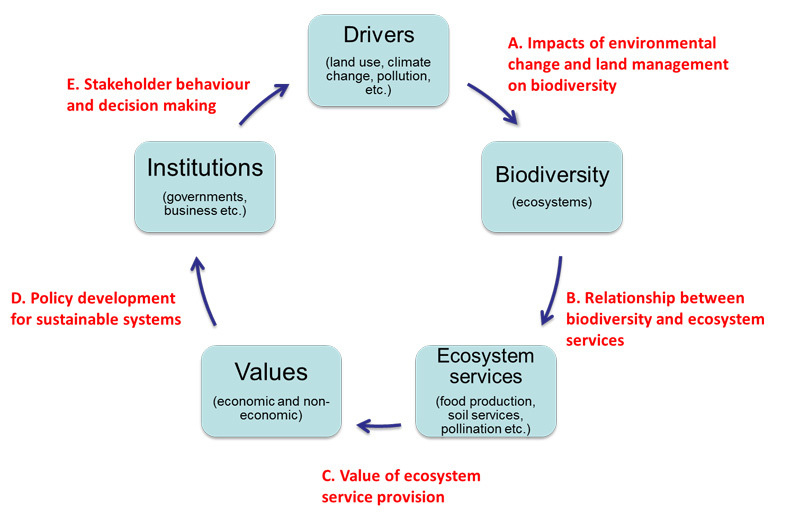 Understanding the mechanistic basis linking biodiversity to ecosystem function to ecosystem services. Research here aims to identify those components of biodiversity, such as species abundance, diversity and functional traits, which affect the delivery of ecosystem services and their resilience to environmental change. Quantifying the economic and non-economic values of service provision and the implications this has for policy and local management practice. A primary focus is on quantifying the contribution of various ecosystem services to crop production, and where appropriate monetising this. Generating relevant evidence bases to underpin policy development, including evaluation of existing policies and demands for land use management, developing indicators and policy evaluation tools. Understanding the motivations and behaviour of farmers and other land managers, as well as consumers, in response to socio-economic drivers and policies, and how this in turn affects land use decisions. This also includes the role of public engagement, outreach and educational activities.